A ways back, we posted about finding your own affordable GPS car navigation unit. However, in good Japanese fashion, many Japanese GPS units come with features that are in no way part of the global standard. One such feature is Vehical Information and Communication System, or VICS (also known as doro kotsu joho tsushin shisutemu 道路交通情報通信システム) for short. Let's take a look at what this feature actually does. In short, VICS is short wave and multi-channel real time traffic information system. The system is in place on expressways and major routes throughout Japan as well as on regular roads that are FM signal accessible. The whole project was started in 1990 by the Nation Police Agency, The Construction Ministry (now The Ministry of Land Infrastructure Tourism, and Transport), and The Ministry of Posts and Telecommunications (now The Ministry of Internal Affairs and Communications) as means of building "smarter roads" and reducing traffic congestion. It is now run as a non-profit consortium with offices all over Japan. Basically, the VICS system acts as an early warning system for your GPS. Local prefecture police, road maintenance authorities and express way corporations report accidents, construction, or other road hazards to the local VICS office. The office then put out a signal via short wave radio and/or FM that can be picked up by VICS compatible GPS receivers. Signals are generally received in the form of audio and visual cues on your GPS, such as icons indicating lane closures, break downs, and so on. How your GPS will react depends on the functionality of the model. Some will automatically recalculate a better route to get around congestion while others might offer you a selection of routes to choose from. However, if you are on an express way, chances are you will be stuck in traffic with few other options. Another more recent functionality is know as ITS. This technology is only available on more recent car navigation units (mostly those sold after 2009). It is basically a short range extension of VICS that uses road sensors to warn you about on coming hazards such as people waiting at a light, backed up cars, closed train crossings, and even motor bikes riding on the shoulder. Traditionally, VICS has only been available on in-dash car navigation systems since it requires an antenna mounted on the roof or stuck to the top of the driver's window. However, there has been a proliferation of mid-to-high end after market models that offer VICS with the aid of 3rd party antenna accessories. Such systems generally require professional installation. VICS signals generally reach your car via one of two means, FM signal in the high 80mhz band and overhead short range receivers (see picture on the left). 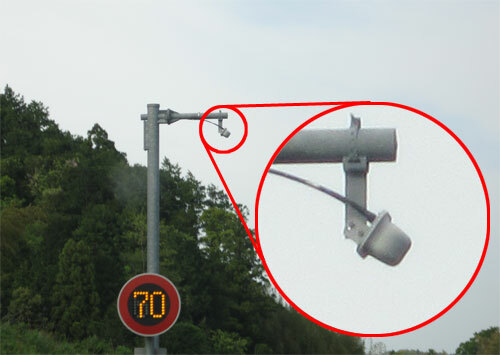 These can be mounted on over head polls on highways, on electric polls, or even on lamp posts. The generally require close proximity which mean you have to pass under them for information to reach your GPS. These are mostly found on express ways and large roads prone to traffic congestion. Transceivers are usually the only option for detailed information where FM waves might not be able to reach (tunnels, streets surrounded by tall buildings, etc). The also transmit data for very specific stretches of road as opposed to FM signals that cover large areas and don't provide super detailed info. Most navigation units will have a VICS logo on the screen, complete with a little clock indicating when the last VICS signal was received. On big high ways, I have noticed that many pole mounted transceivers are only aimed at the travel lane. Because, we all know that no law abiding citizen would ever dream of using the passing lane for anything other than passing. Also, for navigation units that come built into the car, I have noticed that many VICS receivers are connected to the FM radio. This mean you have to have your radio or CD player on to get a signal. As far as accuracy goes, I have found VICS information to be relatively useful, especially concerning lane closures and watching out for upcoming accidents. However, the quality of information is largely dictated by how fast the road maintenance organization or prefecture police units decide to update it as well as your proximity to FM radio towers and local transmitters.